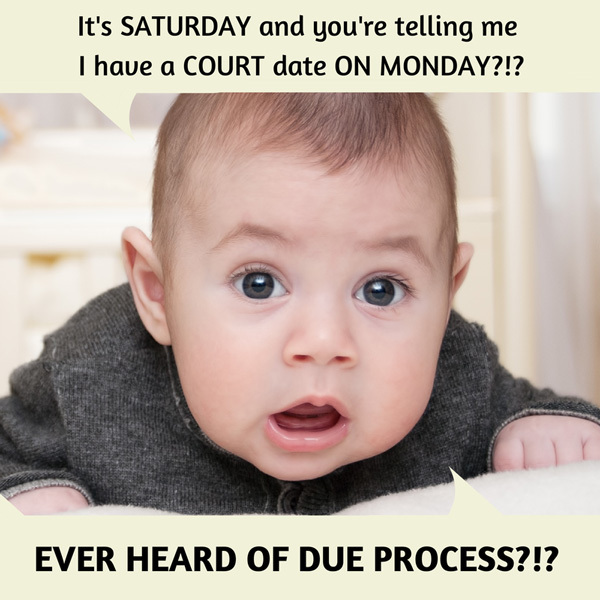 As a recent article in the Los Angeles Times points out, this has created a “rocket docket.” In one case, children received notices in the mail that were delivered on Saturday instructing them that their hearings would be occurring on Monday at a court on the other side of the country! “The fundamental requirement of due process is the opportunity to be heard at a meaningful time and in a meaningful manner.” Mathews v. Eldridge, 424 U.S. 319, 333 (1976). “This right to be heard has little reality or worth unless one is informed that the matter is pending and can choose for himself whether to appear or default, acquiesce or contest.” Mullane v. Central Hanover Bank & Trust Co., 339 U.S. 306, 314 (1950). In non-lawyer speak, due process means that if there is going to be a court hearing to determine whether your liberty is going to be taken away from you, you should be notified well in advance of the time, date, and place where this hearing is going to occur. So, for example, if a judge is going to decide whether your car can be repossessed on Monday, it is fundamentally unfair for you to first be notified about this hearing the weekend before the hearing. The Constitution does not say due process is reserved for U.S. citizens. And the U.S. Supreme Court has recognized that basic right since 1886 — going all the way back to Yick Wo v. Hopkins. The candy bowl in my office is open to all: citizens and non-citizens alike. I invite you to contact me if you wish to avail yourself of a consultation and chocolate. I might have to arm wrestle you for the KitKats, though.